Welcome to the fretted Friends Website! Black Creek Ukefest - May 2015. With special guests, the Pacifica Ukes Student Ensemble. 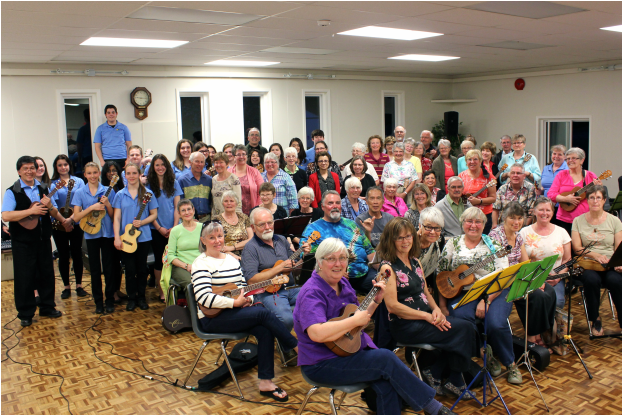 The "Fretted Friends" is a group of ukulele enthusiasts from Black Creek, B.C. on Vancouver Island who meet twice a month at the Black Creek Community Center. The year is divided into two sessions - in the fall from mid-September to December, and in the Spring from mid-January to beginning of May. The group is open to anyone who enjoys playing / performing with an organized ukulele ensemble. ​Previous playing experience is helpful. New members are always welcome. Now enjoying our 8th year! Come and join us in a fun, welcoming and friendly environment and even meet some new friends while playing the ukulele with a group! The group meets every 1st and 3rd Thursday evenings at the Black Creek Community Hall in Black Creek, B.C. from 7:30 pm to 9:00 pm.